As we age our skin changes. Over time, the natural volume of youthful skin begins to diminish as wrinkles and folds form. For many patients, small injections of collagen can help to reduce these lines, restoring a smoother and more youthful appearance to your skin. Once injected, the collagen gently fills furrowed areas of the face and can create fuller lips. The most important fact to remember about collagen injections is that the results are not permanent because the injected material is eventually metabolized by the body. Results typically last six to 36 months, depending on the area being treated and the material used. While rare, a small percentage of patients may experience an allergic reaction. Side effects: patients may experience redness, swelling and possible bruising after the injection (lasting up to seven days). At your consultation, we will discuss your expectations and suggest which material works best for you. Please call for your consultation! 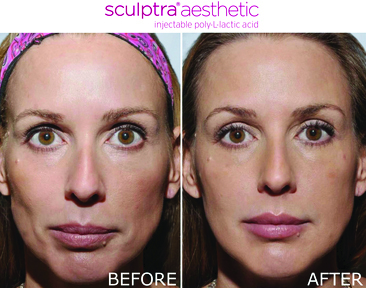 Sculptra® is a facial injectable which stimulates the production of collagen, adding volume to sunken cheeks and temples and correcting smiles lines and other wrinkles. With this approach the effects appear gradually over a period of several months and results can last for up to two years. At least two sessions are suggested for optimal results.